How about another thatched animal? Carrying on with the recent theme of cats, here is another picture of a thatched cat. 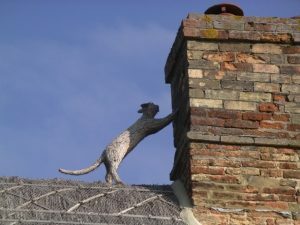 Unfortunately I can’t remember where this thatched cat was; one thing is for sure he certainly is having a good stretch on that chimney. So why do cats stretch so much? If there were an Olympic event for stretching, cats would win gold. They’re constantly stretching their muscles, likely for many of the same reasons that people do. What are the main reasons for this? Andrew Cuff, a postdoctoral researcher of anatomy at the Royal Veterinary College in London reports that “basically, it feels good and increases blood flow”. Cats sleep between 12 and 16 hours a day, about twice as much as people do, according to Rubin Naiman, a clinical psychologist at the University of Arizona; when humans sleep, the brain paralyzes most of the body’s muscles to prevent people from acting out their dreams. The same thing happens to cats during catnaps, which prevents the cat from sleepwalking off the sofa or wherever it’s snoozing. Once the cat wakes up, the stretching begins. The cat is just ready to come in.